bread on an altar among symbols for The Lord’s Prayer. Sunday, July 24 ~ Memorial Mass for Catherine Dial at 2:00 p.m.
Memorial Mass for Catherine Dial ~ On Sunday, July 24 at 2:00 PM, there will be a Memorial Mass for our parishioner, Catherine Dial, preceded by the recitation of the Rosary by members of the Ladies Sodality at 1:30 p.m. A reception will follow in St. Charles Hall. 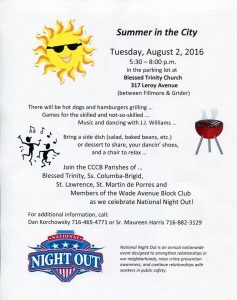 CCCB Summer in the City ~ Tuesday, August 2 from 5:30-8:00 PM is National Night Out at Blessed Trinity Church. Fun, food, games, music and fellowship! We’ll be grilling hot dogs and hamburgers and, if able, we ask you to prepare a side dish or dessert to share. Be sure to bring a folding chair. Contact Daniel Korchowsky at 716-465-4771 or Click HERE for information. We’ll need volunteers to help with food (side dishes and desserts) and to help with chores. There are sign-up sheets on altar rail near Our Lady’s shrine. Please sign up by July 24. Thank you. Ladies Sodality ~ Officers and directors are reminded of our board meeting on Sunday, July 31, following the 10 AM Mass. Agenda includes plans for August 2 “Summer in the City” picnic and scheduling programs for the coming year. Lunch will be served. If you have not already done so, please contact Vera Andrew to confirm your attendance. Poverty in America ~ A recent study revealed that 4 out of 5 Americans will face poverty in their lifetime. Across Western New York, Catholic Charities works to reduce poverty and help those in need through basic/emergency assistance, counseling, education and job readiness services. For more information about these services, call 716-856-4494, any office near you, or go to www.ccwny.org. You can also find us on Facebook, Twitter and YouTube. Training Courses for Day Care Providers ~ Fruits of Labor Training Center on Harlem Road, Cheektowaga, offers courses for licensing and training of day care workers including: Health & Safety, Child Development, CPR and First Aid Training. For questions or further information contact sbates [at] folca [dot] org or call 716-602-9640. Pick up an “information fan” on the table in the front vestibule of the church. New rectory office hours ~ Please remember that since May, we have new rectory office hours: Tuesday-Thursday from 10:30 AM – 2:30 PM. Please call our secretary, Barbara Sercu, at 716-833-0301 if you have changes to your phone number or mailing address or would like to register as a parishioner. 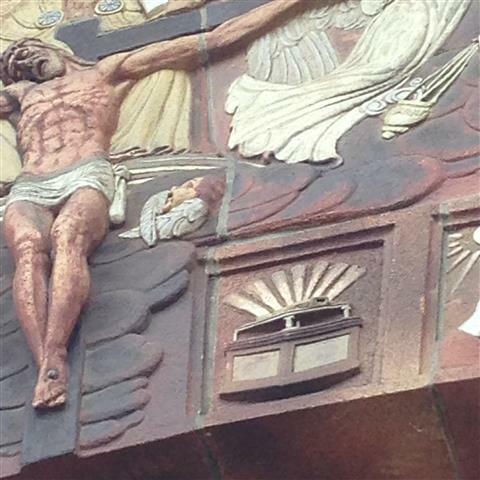 Annual St. Ann Triduum at St. Ann Church and Shrine in Buffalo ~ Annual triduum of celebrations for the feast of St. Ann will take place on July 24, 25 and 26 at St. Ann’s Church and Shrine (651 Broadway and Emslie St.) in Buffalo. Outdoor Rosary and prayers at St. Ann Church at 7 PM each evening, rain or shine. All are welcome to join the celebration. 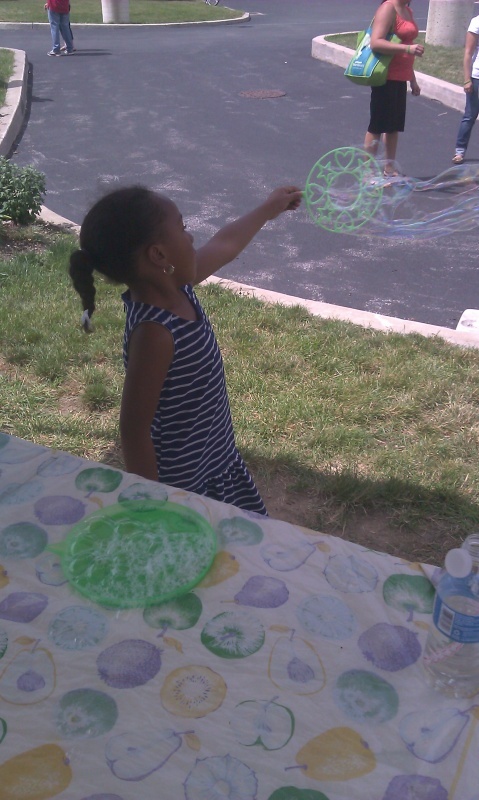 Women’s Respite Program for low income moms over 25 who need a vacation/respite away from the stress of everyday. Dates are July 28, 29, 30, 2016 at the Center of Renewal on the Stella Niagara Campus, near Lewiston, NY. The Program provides a modest private bedroom, all meals, linens, plus great recreational activities that are all optional. It takes place in a beautiful, peaceful setting along the Niagara River. We can even provide transportation. To apply: Fill out a 2-page application. A $15 donation is encouraged. For an application call Sr. Maureen at 897-9948, x114, and leave a message or go online http://www.womensrespite.wordpress.com. Hurry, don’t delay. It’s coming fast.